Let me guess: you’re ready for pumpkin desserts even though it’s still hot outside. Are you already ordering pumpkin spice lattes? Is that you in the drive-thru line in front of me, accepting a venti pumpkin spice latte through the window with eagerness unparalleled at 7am? It’s cool. I’ll wait the extra 10 seconds in line so that you can Instagram it, too. Don’t forget the hashtag #PSL10. I’m ready for pumpkin desserts, too. In fact, when we were in Chicago last weekend, we took a quick trip to Amish country where my husband ordered pumpkin pie. I was a little embarrassed because he ate his pie so quickly that the waitress thought she forgot to serve it. Those sweet Amish ladies must have assumed I starve my husband of the delights of pie. When in fact, he eats PLENTY of desserts (including an entire pan of this one). 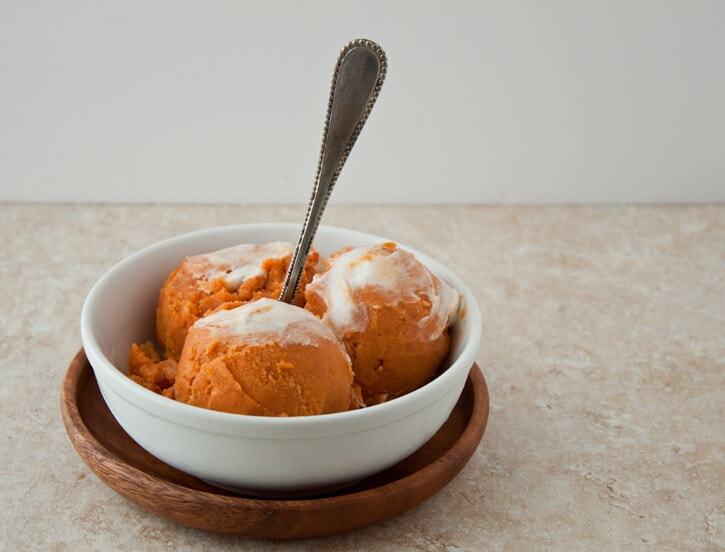 Let’s ease into this pumpkin season with a frozen pumpkin dessert. I made you an intense pumpkin ice cream. You’re going to love it. Because pumpkin is so dense and rich, you don’t need heavy cream for this recipe—whole milk only. So, essentially, this ice cream is good for you. Also, I knew you needed extra protein, so I stirred in meringue streaks after it churned. Wait, that’s a lie. I love the taste of fluffy meringue in ice cream. By the way, if raw egg whites both you, use pasteurized eggs, ok? One more question: do you or do you not want salted caramel sauce on top of this mess? In a blender, add pumpkin, milk, brown sugar, cinnamon, ginger, vanilla and salt. Puree until very smooth. Pour into a bowl, cover and refrigerate at least 4 hours, or up to overnight. Have your ice cream maker ready to go. Pour the chilled pumpkin puree into the ice cream machine and freeze according to the manufacturer's instructions. Mine took 20 minutes. Once the ice cream is frozen, scrape it into a metal pan, cover and place in the freezer to firm up. After 1 hour, beat the egg whites with an electric mixer until soft peaks form. Sprinkle in the sugar and continue beating until stiff peaks form. (You should be able to turn the bowl upside down and the egg whites won't fall out). Pull the ice cream from the freezer, scrape the egg whites on top and swirl. Mix the pumpkin and meringue very well. Return to the freezer for 1 hour before serving. Top with caramel sauce, if desired. It will store for 3 days covered. Recipe adapted from David Lebovitz's Sweet Potato Ice Cream in his book The Perfect Scoop (10 Speed Press, 2007). The meringue ripples in this look amazing! Love that this is a bit healthier because no cream was used. And yes, YES, I absolutely want salted caramel sauce on top! ha ha ha! He ate is so quickly she almost thought she hadn’t served it. waahahaha! That is too funny! This looks amazing! We don’t really do the pumpkin thing here in SA, but my sweet American friend, Carla, has been teaching me the way of the pumpkin in fall! I can kind of see why you guys all love it! I have yet to order a PSL however, I hear that they now have ICED PSL… Which might just kill me. Instead, I’ll make this ice cream. Because, darn it, it looks so delicious! And refreshing. And fall-ish while still maintaining just a little bit of summer. Oh heck yes!! Such a perfect summer/fall treat! Perfect for this transition time! Oh and yes, I want that caramel on top! Bring on the pumpkin! Lovely pumpkin ice cream, Christina! Love the intense color and know the flavor must be as well. Had to laugh over your hubby eating his pie so quickly the sweet Amish waitress thought she forgot to serve him. Thanks for the chuckle to start out the week! 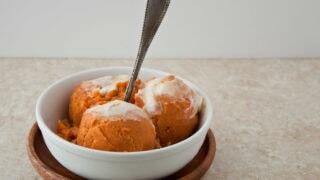 Thanks for starting out with a pumpkin ice cream recipe to transition into fall from summer. Today thru Wednesday, here in Indy, temps are supposed to be in the mid-90s. I need this ice cream now! I could probably eat a whole pan of this too! I think that’s too funny that your hubby ate his pie so fast that the waitress thought she’d forgot to serve it. He must be deprived – lol! This is like summer just gave fall a giant smooch. And yes, YES YES please. Extra caramel sauce. Cheers to caramel on top. This looks incredible!! Great idea to swirl meringue in! Definitely need to make this soon, with the salted caramel sauce drizzled on top! ARE YOU EVEN SERIOUS WITH THIS??????? Yes. I yelled. Sorry, I get excited when I see meringue in ice cream. Also. Salted Caramel on top for mine, thanks. what a great way to ease into pumpkin season. 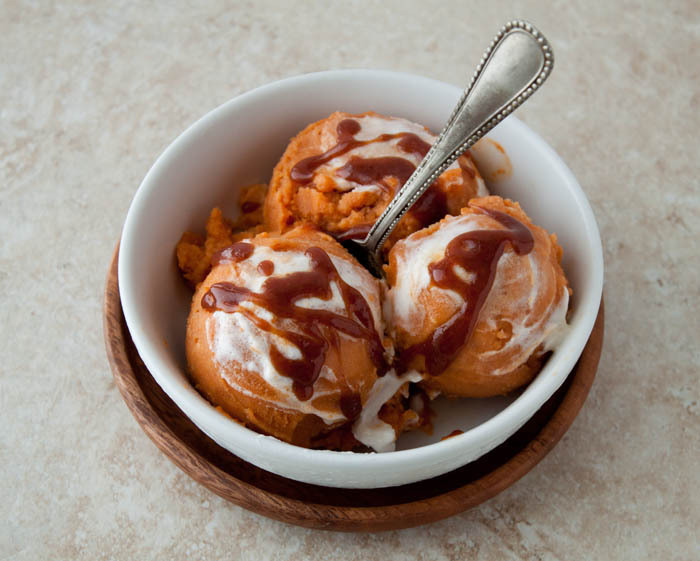 I can’t bring myself to order a PSL just yet, but pumpkin ice creams sounds fantastic. Our sugar pumpkins are about two weeks out. I can’t wait! Oh yes, salted caramel is a must on this! I was definitely guilty of getting a pumpkin spice latte last week. I however waited until I got home to Instagram it. I know how nuts those drive-thru lines can be and I also know how irritable people get when they want their caffeine fix. Making this stat. I seriously have no words – I can’t even imagine how great it’s going to taste tonight! I AM SO READY FOR PUMPKIN. Gah! This looks absolutely fabulous!! LOVE! GAH! WHY I DON’T HAVE AN ICE CREAM MAKER! Sorry, this ice cream is evoking strong feelings inside me. I am so ready to hop aboard this pumpkin train. Although I just can’t get into pumpkin spice lattes – they have a weird after-taste that really turns me off. This ice cream however – yes please! Say what ..say what!! this is everythang ice cream should be.. Word! Yum! I am loving all the pumpkin recipes I see. This looks wonderful. Hahaha I love that B inhaled his pie so quickly that it confused the waitress. That is something that would definitely happen with my father…pie is just a serious business situation! Must be eaten STAT! Love this idea!!! There is a dairy farm in Vermont where I grew up and they make the BEST pumpkin ice cream I have ever had. I try to plan a trip back in the fall just to have some! How can you deny the salted caramel sauce on top? I mean, this is already totally making me faint, so just finish me off with a drizzle of that! Salted caramel sauce? Yes, please. Yay for pumpkin ice cream!!! I made a batch last week and OMG, it’s amazing! Love the caramel sauce idea, too. This looks amazing! Just wondering what size of a can of pumpkin puree? I have seen it in various sizes, so I wanted to check! Are you kidding me with this?!?! I don’t know what to say…speechless. Really well done. This looks absolutely SPECTACULAR! I will be making it ASAP! Um, this is RIGHT up my alley…. Pumpkin ice cream is beyond brilliant for this time of year. My mind is in fall but my body is still sweating out the summer heat in Austin! Thanks for sharing! I love this dessert! it’s the perfect transition from summer to autumn in one bowl! I’m new to the dessertfortwo website. Does this recipe really only make two servings? If not, how many does it make? Could it be doubled to make more? Welcome! Yes, all desserts serve two, or make smaller portions. Ice cream recipes make a small batch, about 2 cups of ice cream. For instructions and information on doubling, please see my FAQ page. you’ve totally got to show us more pictures of the process ! i am always so fascinated at how people make ice cream. it’s the best dessert in the world! i’m still astounded it takes 5 steps. one of these days i’ll grit my teeth and start my own ice cream parlor and i’ll make everything. It seems like a good ice cream recipe to try. Thanks for the post. Raw egg whites kind of make me nervous, but I actually JUST tried a meringue frosting last night and no one died, so I think that’s a sign that this ice cream needs to be in my life asap. I love the recipe so much, I featured it on my blog’s Weekend Wrap-Up today, and wanted to let you know and thank you for your amazing idea. Enjoy your weekend! Here’s a link to the wrap-up — feel free to stop by and grab a badge for your post!